I’m going to talk about this paleo/primal thing for a minute. Feel free to skip to food pictures. Short update: I love it. I eat so many eggs I’m afraid I might turn into a chicken. I’ve lost 5 pounds, eat real butter and real cream, and am shocked at how little I miss most of my old diet. 1. I am not technically following a Paleo diet because I still eat cheese. It’s closer to the Primal Blueprint diet, but I’m not sure I’m even doing that correctly. I don’t actually care very much about whether or not a caveman would have eaten it – I care whether or not it’s going to give me a migraine or make me feel like I’m dying (both things that happen now if I eat the wrong stuff). Being sort of lax with the rules mean I’m not getting all that magical fat-melting the interwebs seemed to promise, but it also means I don’t want to jump off a bridge. 2. Once I got through a few days carb/added sugar/Diet Coke-free my cravings for said things dropped off the map almost entirely. It’s like all the willpower I’ve lacked my entire life just SHOWED UP. Oh hey, Willpower, nice to see you. I could have used you back when my pregnancy cravings had me eating McDonald’s fries twice a day but whatever. I’m really glad the desire is gone because I am NOT making the whole family stick to my diet. Caroline basically does it on her own – she’d rather have eggs for breakfast than cereal – but Evan would starve without carbs. Thanks to my new willpower when I bought the kids special treat donuts after the Fresh Beat Band concert, I managed to bring one home, look at it for a while, then leave it for E to eat. I NEVER could have done that before. 3. I’ve thrown out all the rules about breakfast, lunch and dinner. Steak at 10 am, eggs and bacon for dinner, and eating any time I feel hungry is the new plan. Since I can’t count on easy, instant food I also do a lot more cooking (and dishes) and eat a lot more leftovers. Also, eggs. All the time. 5. My exercise schedule has been pretty sad (or non-existent) since E’s schedule changed back in August. I stopped running and haven’t been going to Stroller Strides. Now that I’ve seen a little success with the diet change I’m more motivated to see if I can amp it up with some workouts. I think it would make a big difference in my shape/jeans size. 6. I’m going to stick with it. It’s not so much that it’s some sort of magical cure-all weight-loss miracle plan, but just that I like it. I like drinking my coffee with real cream and I like putting steak on top of my lunch salad and I like eating eggs – all things I WASN’T doing before because I thought I needed to eat low fat to lose (or even maintain) my weight. This is better. 7. Still no plans to turn this into a blog about paleo/primal stuff, but if you want to talk about it I’m more than happy to on email or Facebook. Thank you to people who emailed me suggestions and recipes and blogs to follow – it’s been SUPER helpful! 8. Who can tell me where to get coconut flour? Don’t say Trader Joe’s or Whole Foods – we don’t have those. 8. Meat sauce over roasted eggplant – I made spaghetti for everyone else and just threw some eggplant in the oven at 400 degrees for 20 minutes. It was better than noodles. I’ve also eaten a lot of broccoli made with this recipe I found on the Girl’s Gone Child blog and successfully replaced rice with grated cauliflower in both fried rice and jambalaya. Plus eggs. Did I mention eggs yet? P.S. ALSO, I made Jalapeno Popper Quiche last night (minus the crust) and it was SO FREAKING GOOD I didn’t even take time to eat a picture before E and I ate it all. So…I signed up for an 8 week weight loss challenge my friend Wendy is holding. I’m going to phrase this post as if someone emailed me to ask these questions – I’m having trouble framing it on my own – but really I’m talking to myself. That’s totally normal, right? 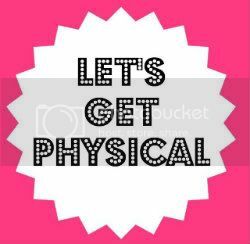 What is the Let’s Get Physical challenge? It starts tomorrow! You can check out the details on her blog, but here’s the gist: Wendy signed up 40+ women who are all working on their fitness (tm Fergie Ferg) to motivate each other. We all bought into the challenge for $25 and there are cash prizes for the people who lose the biggest percentage of weight, plus other prizes along the way. I’m aiming for 12 pounds (realistically) but would be THRILLED if I got to 20. I figure I’ve thrown a lot of money at Weight Watchers and Slim Fast and diet pills in the past – how about this time I motivate myself with a chance to win it back? What kind of crazy diet are you going try this time? I’m going to try Paleo. If you’ve read any of my ramblings about finding a diet and lifestyle that works for me long term you might have noticed my friend Erin in the comments trying to convince me to join her cult of bacon. I started reading this website and bought his book (plus the cookbooks) and I’m going to try it. I actually started last week, to see if I could make it even 24 hours without bread and the answer is definitely yes…as long as I can replace it with bacon. I’m also not going to follow it perfectly and I’m not trying to win any “please explain EXACTLY what the reasoning behind this paleo thing is” debates so if you absolutely HATE paleo feel free to tell me but don’t expect a fight. Although if you’re interested/do it too/have questions I would looooove to talk about it on Facebook or email. Are you going to post before pictures? Maybe when I have nice thin after ones to show. My before picture was an unpleasant wake-up call at how much weight I’ve put back on since losing 30 pounds last year. I am hoping these are the last “before” pictures I ever take. This isn’t going to turn into a paleo/diet/cross fit/healthy living blog, is it? No way. I might tell you about some of the stuff I get to eat (because you’ll be totally jealous) and I’ll probably update in a couple weeks (because hopefully I’ll have exciting! news! to share about how much I’ve lost!) but regular diet updates are a) boring and b) super boring. The group doing the challenge has a private Facebook page so we don’t annoy everyone we know. But like I said, I’m happy to talk to anyone who actually WANTS to hear about it. So, yeah. I think this is going to be good for me. It might end up being another in a long line of schemes I start and don’t follow through with. And it might turn me into a crazy obsessed dieter who never shuts up. And there’s a distinct possibility I won’t be able to stick to it and I’ll end up cheating and gain 20 pounds from all the bacon. But it’s a new month, we’re starting a new phase in our lives, and it feels like a challenge I’m up for. Wish me luck!